50% on regular price item at ACE!! 11/24 only!! 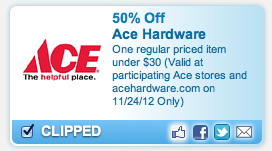 Get 50% off one regular priced item under $30 at ACE! Valid 11/24 only! !